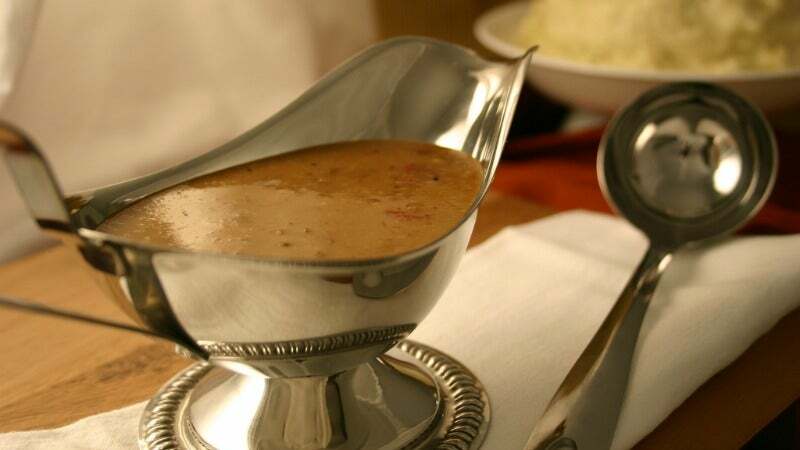 Good gravy starts with a roux, a mixture of equal parts fat and flour that's used to thicken a liquid like broth or milk into a thick, silky sauce. Wheat flour is most commonly used, but you can make a great, gluten-free gravy with sweet rice flour. Click the link below for tips on how to make the best rice flour gravy possible, but it's actually pretty easy. Just cook five tablespoons of sweet rice flour (white rice flour will work too) in five tablespoons of chicken fat for about three minutes, or until golden brown. Gradually add in chicken stock, one cup at a time, whisking constantly. Let cook until thickened to your desired viscosity, stir in any pan drippings and seasonings you like, and serve.